Pocket, the startup behind the eponymous app that allows users to save Web content to read later, has raised $5 million in new venture funding. Leading the series B round was Foundation Capital, with participation from prior investors Baseline Ventures and Google Ventures. With the latest funding, Pocket has raised a total of $7.5 million. The San Francisco-based company said it would use the new capital to expand its core “save for later” experience to serve even more devices and platforms, bolster the team, and further improve services for developer and content partners. Formerly Read It Later, the company relaunched as Pocket in April, with an updated version of the service that allows users to save material like articles, Web pages and video for later perusal on their phone, tablet or PC. The Pocket app, completely free since April, is available for IOS, Android devices and the Kindle Fire. In addition to collecting Web content directly, Pocket is also integrated with more than 350 apps, allowing users to save material from content aggregators and social media properties such as Flipboard, Twitter and Zite. The company’s 6 million users are now saving 1 million items a day, and have saved over 200 million over the last five years. About half of the saved content is viewed on mobile screens. 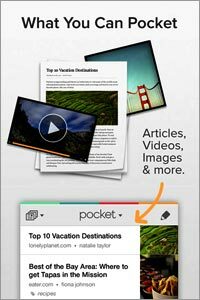 Pocket competes most directly with other read-it-later apps such as Instapaper, which charges $2.99 per download, and Readability, which is free. Now that Pocket has discontinued its own paid version, how does it plan to make money? Pocket founder Nate Weiner noted that a quarter of its users had paid for the service. “We know this is a product that brings significant value to users. This funding allows us to focus on building the best possible product for our users,” he said, without elaborating on plans for Pocket’s new business model. What’s clear is that is that its app has proven a hit with users. The latest version of Pocket’s iPhone app has earned a five-star rating in the App Store, based on feedback from about 1,000 users, and a four-star rating for all versions. Weiner said 70% of active users have 2 or more devices synced to the Pocket app, and that Pocket is one of the most “shared to” services on newsreader apps like Zite.